Why write your own courseware when we’ve done it for you? The Council provides its members with a range of pre-written courseware that you can customise, brand and print. Fully customisable courseware packages designed to address today’s most pressing HR and business concerns. 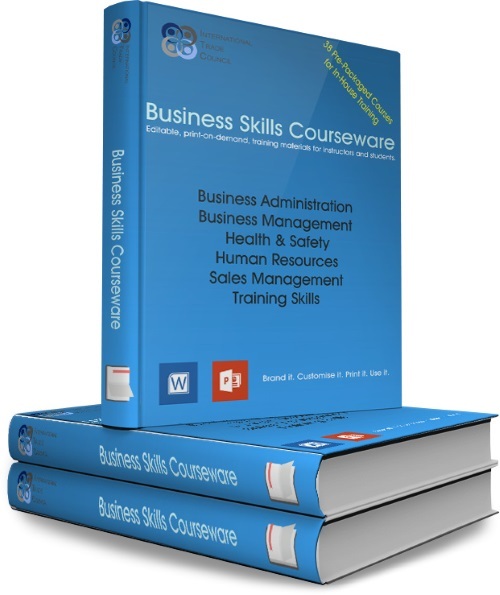 These courseware solutions are designed to improve skills within organisations, leading to better employee retention, higher productivity and greater sales. Add your own company name and logo. Fully editable files (Word, PowerPoint). Modify and customise it for your own needs. Use assessments before class to determine skill levels and what topics to cover. Use assessments after class to measure learning. Explanation of the concept by the instructor. Step-by-step instructions together with practical examples and practice exercises – keeping students fully active and engaged while they are learning. Results oriented content which is designed to be relevant to “real life” applications. Supporting materials designed to ensure that learned skills are retailed by attendees. No per-unit royalties. Print what you need, when you need it, as many copies as you need.